Subtitled "last night a cart case saved my life" - this Magma cart case saw my Ortothuds travel from ruralist north England, through the hell of public transport (including London) and safely across the bottom half of England for German scratch master Rafik to use and abuse because he forgot to bring some with him (huh?) and then all the way back oooop norf via the torture that is the Royal Mail. Having arrived back in one piece, I figured it was worth of a review. Seems like September is battle month. Raida's European Gong Battle for Supremacy is happening, as is the 2006 DMC World Finals. And now we have Guitar Center's Spinoff battle 2006. And these guys don't mess about prize-wise - up for grabs is a whole car - a Toyata Scion plus a whole stash of mind blowing goodies. Now that's what I call something to aim for. We don't have Guitar Center (or even centre) in the UK. Seems that we need one very soon. It's a special year for DMC in more ways than one. This year sees the battle come of age - yes it's 21 years old this time round. Oh dear lord, do I feel old now. But that's not all - it's all change(ish) in the battle itself. At the end of last years battle, details leaked out about new rules and new sponsors and this year has seen them implemented. Danish needle giants Ortofon have ridden in on their trusty steed and pumped some serious cash into the battle - $30K to be precise on the condition that only Ortofon carts can be used. The upside however is that competitors can use any mixer they like. Despite this people are still using the Technics mixer... go figure. Anyhow, after some confusion and potentially expensive lost airfares, the 2006 DMC World Finals will be happening not in Paris but London at the Hammersmith Palais on 10-11th September (yes I know - Sunday and MONDAY). And tickets are available to pre-order now. Within the pages of skratchworx, we get to report on all sorts of techno-goodies. They come in all shapes and sizes but I never thought I'd be posting up a news story about a mobile phone. But the new LG U400 is newsworthy for 2 very good reasons - firstly it's also an MP3 player with a built in scratch wheel (no really) but it's also being endorsed by the mighty DMC, who have also provided some scratch content for the U400 too. I wonder if they'll let you use it in the finals? "We would like to invite all of his friends to a Service we will be having for ZV on Sat. July 29th.@2pm. This will be held @ San Joaquin Catholic Cemetery located @719 E. Harding Way in Stockton, CA.. We will be having a reception following the service @Eagles Hall located @1492 Bourbon in Stockton. If you would like to play a little music in Tribute to ZV please feel free, this would be an Honor to ZV and will show the Love and Respect his friends had and still have for him." I'll play a song for Zeevee in the skratchlab tomorrow. Peace and love goes out to Zeevee's family. 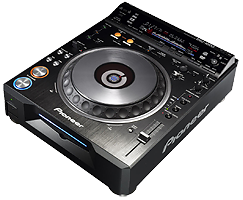 First there was the CDJ-1000, then along came it's baby sibling the CDJ-800. Having less bells and whistles, it was the perfect toe dipper for DJs wanting to sample a lump of Pioneer quality. And then Pioneer went and raises their game, pushing that digital envelope into an area not previously thought possible on a desktop deck - video. Out came the DVJ-X1 and people around the world sold their souls just to own a pair. So it wasn't an enormous leap of the imagination to work out that once people had recovered from first seeing the somewhat awesome DVJ-X1 in action, that Pioneer would at some point unleash a baby DVJ - and they have - and it's called the DVJ-1000. The first weekend in September just got a whole lot busier in good old London village. 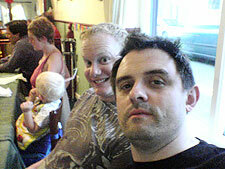 Firstly, it's PLASA 2006 as well as the DMC World finals in the same weekend (and almost the same postcode). So now there's a good reason to make a very long weekend of it. Having covered Roc Raida's Gong Battle for Supremacy back in April, people commented on how cool it would be to bring it over the ocean to Europe. So those bloody Eclectic Breaks do-gooders have only gone and done just that. People - I give you the European Gong Battle for Supremacy. Oh Dear Lord - the temperature is killing me here. But just when I thought it couldn't get any hotter, M-Audio go and announce a new DJ division called SynchroScience� and with it, 2 new products, aimed squarely at the digital DJ. Working hand in hand with the new Torq software, the new Conectiv controller works like an SSL box - and then some. Unless you've been living in a cave, you can't have failed to notice how the renaissance of Numark goes from strength to strength. 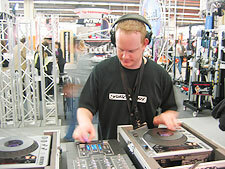 Having taken Akai under the wing of Numark Alesis, their collective product range and next level new products has seen them sitting at the top of the DJ manufacturer tree in 2006. But they also want to give something back. To celebrate the pioneers of the electronic age, Numark are throwing a big bash at Berklee in Boston, US, the proceeds of which will fund scholarships for the next wave of musicians. Get ready for Milestones - coming your way in September. Oh but wait, there's a competition as well where you can win a heap of goodies. Free Hip Hop in NYC! OK I know I'm a bit late with this but there's still time to catch some free Hip Hop action in New York courtesy of Tools of War. Each Thursday until the end of July, you'll be able to catch some of the originators and pioneers doing their thing at the epicentre of the birth of Hip Hop - Crotona Park in the Bronx. There's 2 Thursday events left with a Cold Crush Brothers Wednesday special to look forward to. Battle wax has been around for ever now and while we all blindly fork out hard earned cash for doubles of what we hope will be the next big thing, we're often treated to a rehash of previous releases. Breaks of various styles and speeds, mixtures of aaahhhs, freshes and the usual noises tends to be the formula for most releases. So when I got the new Dialogue and Random was fresh outta France, it was clear that the mould had been broken, smashed and the vapourised. Prepare yourself for something very different indeed. Hola! El Controller Uno est� aqu�!! It's been a while since we heard anything official about Vestax's revolutionary new musical instrument turntable the Controller One, but it seems to be surfacing in Spain, courtesy of DJ Tedu. Last month saw a movie on the scratchernet of a very basic short demo of the C1 but now we have a better one from DJ Loomy. Sadly (and not very usefully) it's all in spanish but you do get the idea. If you're like me, your turntablist experience is not a tidy one. I have a tendency to leave records out of covers, cables running across and between mixers and decks and generally treat the skratchlab like a major league dumping ground for the daily lumps of chaff that infest my life. So what we need is order. And In my meanderings around London Calling, I happened upon Deconomix - a company dedicated to ensuring that your DJ life is an organised life. So the cleanup continues - filling the gaping holes in the review list, and there's quite a few more to go yet as well. Nothing earth shatteringly cutting edge this time, just a nice accessory that every crate digger should have - the Vestax Handytrax. It's never going to set an audiophile's world on fire but as a vinyl junkie tool, it'll save you from buying mashed wax or just crap music. Haven't we all done that before? I just want to give a big shout out to an unsung hero of . NdB has been a friend, a family member and travelling companion to each of the Musik Messe events and this year will be doing his first PLASA and DMC World finals. But more importantly than that, he is officially dead old today, reaching 30 years. And as if that wasn't enough, he married my sister-in-law in Greece 2 weeks ago. I want everyone to wish happy birthday to this vital member of the (quite literally) family! See you on Saturday for the BBQ and Q&A! Just reminder that today is BBC Radio 6's special RUN DMC Day, celebrating the career of RUN DMC and the 20th anniversary of "Raising Hell" hitting platinum. And today is the day for the competition where you can win a full DJ setup from Numark and special one off slipmats from Slikmats. And you can enter the competition right here. Being DJs, we collect vinyl, play it and put it back on our shelves and barely give the covers a second look. But someone has spent time making that cover and there are some truly great sleeves out there worthy of our attention. Instead of seeing only the edge of the sleeve, why not put them on display? Enter Art Vinyl. Hot on the heels of QBert's "Breaktionary" series comes a new Dirtstyle release. Utilising some of the funky breaks found on Q's opus set, Skratchy Seal brings you "Skratchy Seal's Training Wheels". It's all about fast and funky skipless breaks - perfect for jugglers rather than skratchers as is Q's thing right now. UPDATE: Now with added rough and ready demo movie. So here it is - the new scratch mixer on the block, the revised AEM100i. Complete with cosmetic makeover, ditching of some less than popular features and improving the existing ones a little, the AEM-100i aims to have a broader appeal without sacrificing the analogue synth effects that set it apart from the already saturated scratch mixer market.